MONTARGIS, France (BRAIN) — After more than three years in development, Hutchinson Tires has launched its ElevenStorm compound, which the company is now using for its Fusion 5 tubeless-ready Galactik race, Performance and All Season road models. LOS ANGELES (BRAIN) – When it comes to retail, Chris Kelly has always been one to think outside the box. DÜSSELDORF, Germany (BRAIN) — On the heels of launching the second model in its Turbo pedal-assist line, the urban-focused Vado, Specialized has opened a pop-up store here. MONTEREY, Calif. (BRAIN) — It had been a number of years since renowned Bay Area chef Chris Cosentino attended Sea Otter. 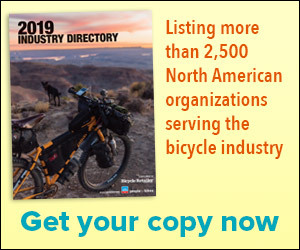 But as a former pro 24-hour mountain biker who raced in the singlespeed category at events all over the U.S. and the world, Cosentino is no stranger to the bike industry. MONTEREY, Calif. (BRAIN) — One dominant "brutal truth" that emerged at this year's Bicycle Leadership Conference, which wrapped up Thursday in Monterey, was this: The industry is struggling to keep up with, adapt to and embrace changing consumer behaviors. BALTIMORE (BRAIN) — After working on the project for more than two years, renowned mountain bike champion Marla Streb has opened HandleBar Cafe and Bike Shop with her husband, Mark Fitzgerald. TAIPEI, Taiwan (BRAIN) — Lezyne has added a route-building function to its GPS cycling computers and watches. It allows users to create riding or running routes on the company's GPS portal website. TAIPEI, Taiwan (BRAIN) — The topics ranged from e-bikes and engineering to bike share and infrastructure at the Taipei Cycle Show's inaugural Bike to the Future urban cycling forum held on Thursday. TAIPEI (BRAIN) — Xplova isn't yet widely known, but this Taiwanese maker of computers and power meters is hoping to crack more major markets — including the U.S. — later this year. The company launched its latest updates to its X5 computer at the Taipei Cycle Show this week. TAIPEI, Taiwan (BRAIN) — There is perhaps no rider who can put a brake to the test better than a World Cup-level downhill racer.